Have you ever made an MMD video but keep forgetting who made what? Do you keep forgetting which models, effects and accessories you used for your videos? Do you wish there was some way to make crediting easier? MMD Credit Helper and PMMLookupper! When it comes to making MMD videos, crediting is always required, but sometimes we never keep track of what we use and who made them. This is where MMD Credit Helper and PMMLookupper come in handy. They are both similar applications when it comes to what they’re for, but putting up more than one option is always good! You’re probably asking: “What’s MMD Credit Helper?” or “What’s PMMLookupper?”. I’m glad you asked. MMD Credit Helper and PMMLookupper are applications that analyze your .pmm and .emm files and makes a list of models, accessories and effects used for your project and where they’re located on your computer. What’s more is that you can export this list as a .txt file so that you can look at it for future references. You can open pmm and emm files through drag-and-drop. I stumbled upon MMD Credit helper when I saw the credits of an MMD video from NicoNicoDouga where it says that one of the programs used was MMD Credit Helper. Curious enough, I decided to “Go Google It!”. Unfortunately, there weren’t any English sources that I could find to help me work with the whole thing. So I had to navigate my way through Japanese blogs. As You can see, the interface is fairly simple. Kind of similar to a common text editor like Notepad, right? The OK button lets you save the list as a txt file. This one is almost the same as MMD Credit Helper, but it has some other things that are not in MMD Credit Helper. …Unfortunately it does not support vmd/motion data and vpd/pose data files; hopefully they do the next time they update. 2 – Allow duplication. Clicking on the check box shows duplicates of the same file path. 3 – Show folder path. Clicking on the check box only shows the folder paths, not files. 4 – Arrange list. Clicking 5 from the drop-down arranges the list alphabetically according to file extension. Clicking 6 from the drop-down arranges the list alphabetically according to the folder name. 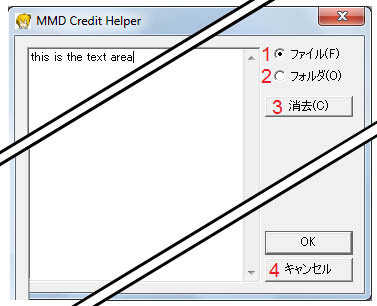 So, how exactly does MMD Credit Helper or PMMLookupper help with crediting, you ask? You have different versions of the same model. Same modeler, same look, but different versions. You can’t tell which version you used. You have a huge inventory of models, effects and accessories that has become too big to keep track of. You forgot what a certain effect is called. 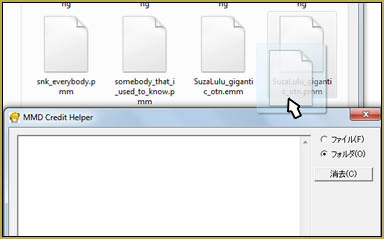 MMD Credit Helper and PMMLookupper help you find the folders where your files are located in which there’s usually a readme.txt inside. From there, you can specifically tell which models, effects, accessories, etc. you used for your project. Crediting wouldn’t be so much of a chore from now on! Remember to always credit as a respect to the owners/modelers. … which one would you like? The NicoNico video is region restricted, but still helpful for giving out the download link. The zip comes with 32 and 64-bit versions. There’s no difference at all. >Unfortunately it does not support vmd/motion data and vpd/pose data files; hopefully they do the next time they update. I’ve got an impression that pose/motion data is applied straight to FMP without saving the original file (makes sense, considering that you can edit motions after loading). At least, I haven’t found “vpd”/”vmd” strings in a file made with that sort of data, while “pmd” can be seen there). So, unless MMD itself changes that policy first, there won’t be those files recognition in PMMLookupper. KillerBeer … You are correct, I just tried it. 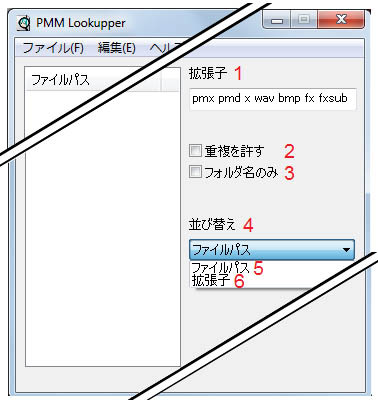 But older MMD versions did not save an EMM file along with the PMM … so PMMLookerupper is good for older saved PMMs. Actually, you can get that info without needing an external program, simply by opening an .emm file in a text editor.